���� Mild mannered London academic Perry McKendrick (Ewan McGregor) is on holiday in Morocco with his Barrister wife Gail Perkins (Naomie Harris) trying to repair their relationship when he meets, and falls under the spell of, larger than life Russian Dima (Stellan Skarsgard). Gail is also drawn into Dima�s circle, meeting his wife Tamara (Saskia Reeves) and their children. At a birthday party for Dima�s 17 year old daughter he takes Perry aside and reveals that he is a top level money launderer for the Russian mafia, the Vory. The previous head of the Vory has died and his son, called The Prince (Grigoriy Dobrygin), has taken over, redefining the way the Vory works and liquidating the old guard. A close friend of Dima and his family have been killed and Dima knows that his time is coming. He asks Perry to take a data stick with him when he returns to London and to give it to MI6. Dima is prepared to provide evidence of Russian mafia payments to prominent UK government figures, including ministers, in return for asylum for himself and his family. ���� On arrival in London Perry provides the stick to MI6 and is interviewed by Hector (Damian Lewis). Hector is keen to establish the trail of mafia money being paid to corrupt government ministers but his superiors want no part of any investigation and refuse to sanction any operation. Hector, nevertheless, is determined to proceed without official sanction and he needs Perry and Gail to get back into contact with Dima to obtain enough additional evidence to convince Hector�s masters that there is a case to answer. For the sake of Dima�s family Perry and Gail agree. What follows is a clandestine operation that moves from Paris, to Bern and then to a safe house the French Alps; can Perry help get Dima and his family to safety, and the evidence to London, before the Vory assassins kill then all. ���� Our Kind of Traitor is based on the novel by John Le Carre and directed by Susanna White whose credits are mainly in TV. Our Kind of Traitor is Le Carre moving away from the Cold War into themes, such as the influx and influence of Russian black money in the UK, which could not be more topical. 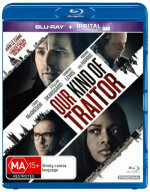 Some of Le Carre�s usual themes, such as the underhandedness and betrayals within the British spy establishment, are present in Our Kind of Traitor, however catapulting an na�ve and innocent civilian into the centre of a mix of murder, mafia, money and spies strains belief more than most spy thrillers. To accept that any reasonably intelligent academic would accept a data stick from an self-declared mafia member to deliver to British intelligence after a couple of meetings and then expect that that was all that was at stake is just too unbelievable, and things don�t really get any more realistic from there. The film tries hard to get over this hurdle by making Gail initially the voice of caution and reason but even she all too quickly gets swept up into the operation. One might expect that a barrister would know better. ���� This aside, Our Kind of Traitor features some stunning on-location shots in Morocco, Paris, Bern and the French Alps and a couple of tense set pieces including the escape of Dima�s family in Bern. Ewan McGregor is all boyish charm making his character�s journey from meek to action man somewhat hard to accept but the flamboyant Stellan Skarsgard is a delight as a man with hidden layers and Damian Lewis is very effective as the manipulative MI6 agent. In the end, however, even this cast cannot make the plot in any way believable. ���� Our Kind of Traitor is presented in an aspect ratio of 2.40:1, in 1080p using the MPEG-4 AVC code. ���� Shot digitally using Arri Alexa rigs, Our Kind of Traitor is features strong detail and is solid in motion. Colours have a very, very glossy digital look and have been manipulated to produce a very golden glow in Morocco while European locations have a blue overlay. Blacks and shadow detail are excellent, skin tones natural, contrast and brightness consistent. Marks and artefacts are absent. ���� White English subtitles for the hearing impaired are available and come on automatically during the sentences in Russian. ���� Audio choices are English DTS-HA MA 5.1, English LPCM 2.0 stereo and English audio description utilising a male voice (LPCM 2.0). Be aware that the default audio setting is the LPCM 2.0 stereo. ���� This is a film that relies upon dialogue and situation rather than extensive action sequences. Dialogue is clear throughout. The rears and surrounds were used for ambient sounds, such as the crowd at the ballet and engines, while the gunshots were loud and reverberate. The subwoofer supported the one explosion and engines. ���� The orchestral score by Marcelo Zarvos was melodic and effective. ���� An EPK type featurette with lots of film clips, a little bit of onset footage and sound bites from director Susanna White, cast members Stellan Skarsgard, Ewan McGregor, Naomi Harris, Damian Lewis and Mark Gatiss, screenwriter Hossein Amini, DP Anthony Dod Mantle, two producers, the hair and make-up designer and production designer. Covered, superficially, are Le Carre�s world and themes, the film�s characters and locations. ���� Five deleted scenes that follow one after the other. There is no text but all except one start with the film which shows where the deleted scenes would have fitted. ���� These interviews can be selected individually or there is a �Play All� option. The interviewees answer the questions posed by an onscreen text. Susanna White speaks about her favourite location, challenges of the shoot, comparing TV and feature film shoots, the cast and characters, the involvement of the Le Carre family and her favourite scene. Ewan McGregor talks about the source novel, his character, locations and his co-stars. Stellan Skarsgard speaks about the novel, his character, learning to play tennis for the role, locations and working with the director. ���� The Region A US Blu-ray of Our Kind of Traitor is the same technically and adds Spanish subtitles. It has the same making of and deleted scenes as ours but misses out on the interviews, instead having two short (3 min) featurettes on the cast and story. Our StudioCanal release would be the same as is available in the UK. I think in this case Region B wins. ���� Our Kind of Traitor has wonderful locations and a well credentialed cast but struggles to make sense of a less than believable premise. If you can just go with it is an enjoyable enough spy thriller. ���� The video and audio are fine. The extras are minor but there are some.